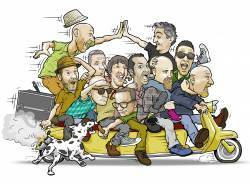 The Busters Skankin' News will provide you with the right amount of The Busters Gossip on a regular basis. Simply fill in your adress below and you will receive the next issue, too. P.S. : The rainy days are over! All shows are confirmed. Get your ticket soon! in Munich (Jan, 6th 2018) THE BUSTERS are supported by our good friend Michael Unfried FENZL! The former Django 3000-doublebass-player starts his new Soloproject! If you want to check out our new arrangement (and new numbers), we cordially invite you to (skank out / rock out) on our upcoming tour. On December 27th, The Busters will be running at full throttle with bellies still full of Christmas dinner! 16.02.2018 BOCHUM / BHF LANGENDR. New CD STRAIGHT AHEAD finally out! THE BUSTERS' journey continues: unimpeded, and after 17 albums and 31 years the course is still unmistakably clear: Straight ahead! STRAIGHT AHEAD, the new album from THE BUSTERS (amazon - iTunes), has 17 fresh new tracks, featuring Joe Ibrahim, from the Heidelberg band, "Megaton", as the new front man, together with Richie Alexander, to set the stage. The new liveclip of THE BUSTERS! Come join us. From the current album SUPERSONIC ESKALATOR. Ca Plane Pour Moi - French Toast! The new video of THE BUSTERS. From the current album SUPERSONIC SCRATCH. 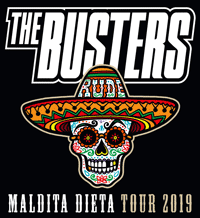 The new liveclip from THE BUSTERS! Stronger than ever! Evil Eve - The Video! The new Arthouse-Video from THE BUSTERS. Featured on the current album SUPERSONIC ESKALATOR. We recorded a cover version of Django 3000s song "Heidi" for their digital only "Heidi Reloaded EP". From the album "Supersonic Eskalator". We worked it out. From now on you'll find all our lyrics at our website.